Crumble the muffins and divide among the bottom of four 12-ounce glasses reserving about 3/4 cup of the crumble. Mix the cinnamon and yogurt, and divide half of it over the crumbled muffin in the glass. Divide the watermelon and dried cranberries over the yogurt in the glasses. 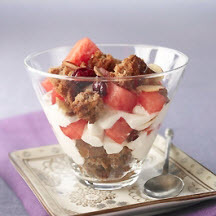 Divide the remaining yogurt over the watermelon and dried cranberries. Divide the remaining muffin crumble over the glasses and top with honey. Garnish with the toasted sliced almonds and top with watermelon cubes.